I was super stressed, tensed.. I was acting like a dinosaur, fierce and going mad at everyone, trying to control everything possible, And eat them too if needed..Yes, I wanted the day to be perrrrrrrrfect. On your wedding day, you want to look like the most beautiful version of yourself – not an overdone bridal version of yourself…Right? I am a fan of dramatic makeup, especially eye makeup, but for my D-day I wanted my makeup to be as simple as possible. But when you hire a MUA not everything will go as per your wish. I was very much apprehensive. I didn’t want to look like an overdone bridal version of myself. Moreover, I was on budget and trust me; budgets are almost always one of the hardest, and scariest, parts of planning a wedding. Anyway, after a lot of dilemma I hired Aniruddha Chakladar for my D-day, and to my utter amazement I found him to be the most reasonable celebrity makeup artists. I liked his work always. Normally I have problem free skin but thanks to the unlimited stress, pimples popped out just a day before, which freaked me out even more. Why pimple, why? Anyway, the MUA used MAC foundation and compact on me. The shade he used was NC40, whereas I am NW25. I got so scared that I stopped him midway. Simply because it was turning me into someone I am not. It made me look dull. So he just reluctantly went to concealing. I had dark circles and a few pimples which needed to be ‘concealed’. After using the concealer he used translucent powder to set the makeup. As I have mentioned before. I just wanted my eye makeup to be simple. Most of the brides, whom I see nowadays, are layered with so many colors and glitters on their lids and that’s the only thing I didn’t want on me. I am not saying that they don’t look good. Most of them look truly beautiful with the heavy makeup, but I am not comfortable with it and thus just wanted soft kohl smudged eyes. After grooming my brows and highlighting brow bone with a pearly natural shade, the MUA applied a wash of rose gold on my outer corner blended with a satiny skin color eye shadow on my inner lid. He then applied a black eye shadow on the extreme outer corners and blended well with the rose gold. After applying a thick stroke of kajal on my lower lash line, he took the same black eye shadow on a brush and smudged the kajal with it. Finally he rounded off my eye makeup with two layers mascara. I also didn’t want any false eye lashes as they feel heavy and I feel uncomfortable. 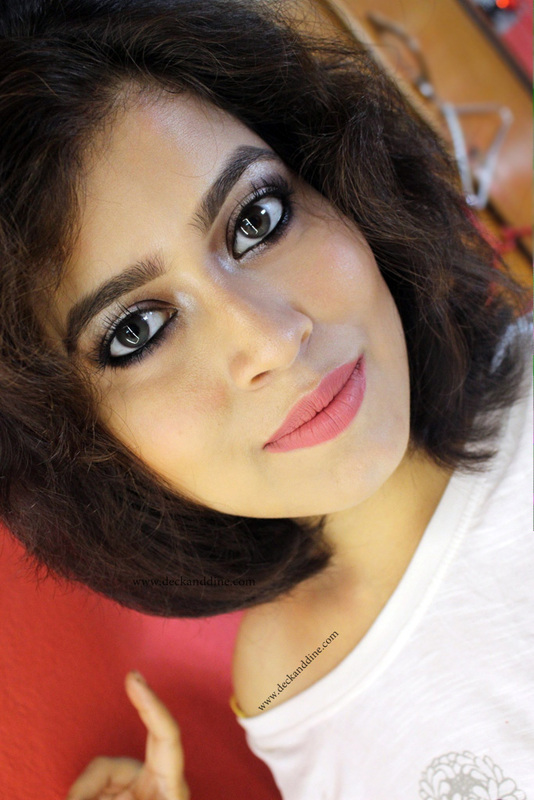 A simple matte red lipstick after lining lips with a red lip liner. Lightly contoured-highlighted and a light wash of rose blush for that natural looking cheeks. There is nothing sexier than a red bindi. 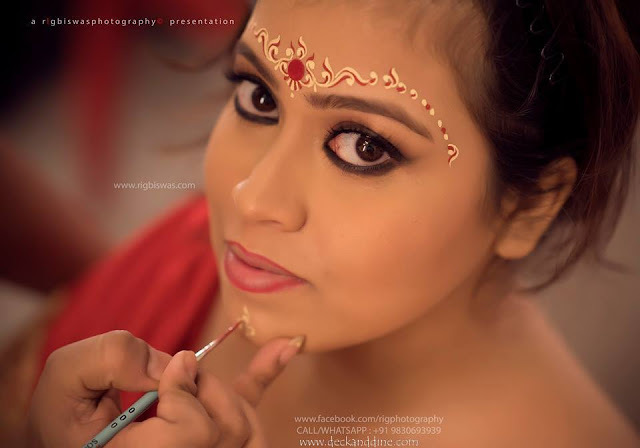 Bengali bridal makeup is incomplete without a red bindi and chandan work on forehead. Traditionally, chandan was used to draw the beautiful motifs, but nowadays instead of chandan, mainly white and red colors are used. My MUA used chandan colored color instead of white and I loved how natural “chandanish” it looked. A few drops of liquid highlighter mixed in body lotion. What else than a red benarasi draped in traditional Bengali style? I also wore a red veil. 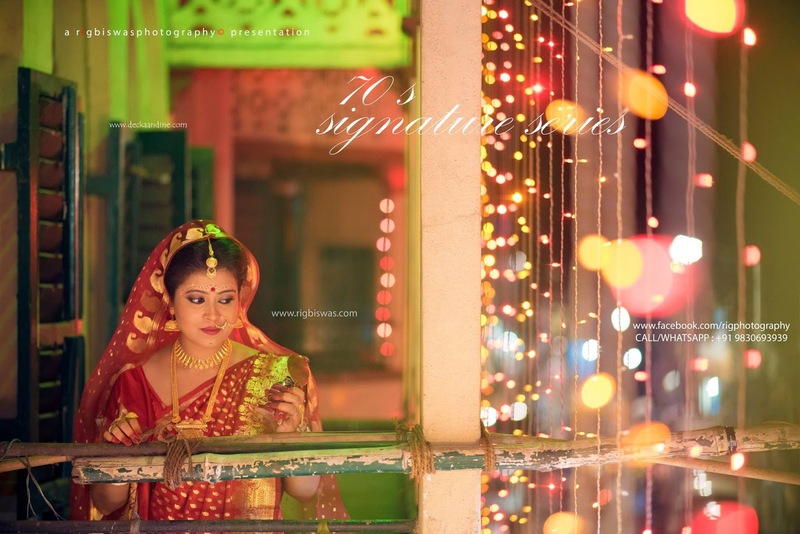 Traditional Bengali Indian brides are often seen with normal hand buns which are decorated by beautiful flowers and hair accessories. Mine was no different. The front portion of the hair was puffed up for a voluminous look and the rest of the hair was tied in a gorgeous bun. 4 red roses were tucked in one side. Accessories play a very vital look in enhancing a bride’s look. I went for traditional gold jewelry, some of which belonged to my mother, some gifted by my father and two pieces bought by me. There is a different feeling of these altogether. Ears:- Jhumkas are my absolute favorite. They are gorgeous, stylish, elegant and add touch of sophistication to your whole look. Neck:- A choker and a shita haar. Hands:- Sakha-pola, set of bangles and ratan chur. Photo courtesy: Rig Biswas. Contact him here. P.S. If you want to get yourself featured in our bridal section, then mail us at madhu.9615@gmail.com. You look gorgeous Madhubani.. Love your eyes and eyemakeup.. I have attended a Bengali wedding before & loved the sarees everyone wore.. Thanks a lot Harine.. Do you like wearing saress? Then you must try one of our traditional sarees..
You are looking fatafati Maddy. Just love the whole look. U r beautiful already from inside and i love the pics capturing ur unique expression. God bless you with a great married life. Hope you enjoy every aspect of it. P.S. you know there is some glitch in the base section of your article. I don't know may be its my device problem or what, but i cant read all of the base details section. Its broken. Edited...dont know what went wrong..
U r one of the most beautiful brides I have evr seen. You are one of the most lovable friend i ever had..
You are looking absolutely Stunning :-) A real Indian Bride . The simply stunning bride. Didnt looked like stressed to me but more like enjoying every aspect of her day!! U are really fabulous madhu!